SHNARK wears its last meal's flesh as a disguise so it can get close to its trusting prey. 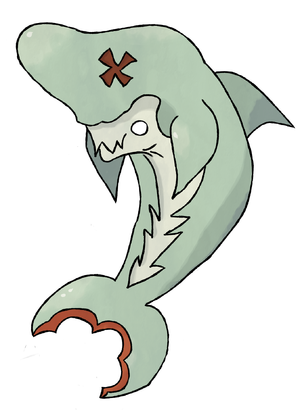 Shnark, the Disguised tuxemon, is a Water-type monster. Based on a goblin shark. Design and front and face sprites by Sanglorian. Back sprite by Impossible Realms.